Well said! The needle felt piece is adorable. Oh, my goodness! What a wonderful friendship ya'll had and what a sweet decoration! I'm so sorry that Nancy has passed, but I can only imagine what treasured memories you have of your adventures together. I loved Nancy's blog. She was so adventurous. I was so sorry when you told me that she had passed. I know you must miss her a lot. Her lion and lamb are adorable. I love the fuzzy mane on the lion. Thinking of her and YOU today. Loved your post. Having a lifelong friendship like that is a precious gift. And now you can smile and remember her every time you see this ornament. Beautiful tribute. So healthy to remember all the memories you have and not how soon she left. God gives us just a few special friendships and I am so thankful for yours. That was a beautiful tribute to your friend. Life is indeed short. But how wonderful to have so many memories with her. it sounds like she passed on her love of the needle arts to many. That is wonderful legacy too. 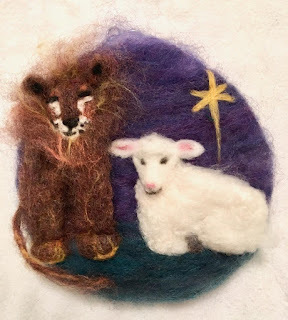 The needle felting is beautiful. Thank you for sharing with us today. Lovely memories. You must miss her terribly. Hugs! She was a real sweetheart! I miss reading her blog; she was a talented, fun person, and you were lucky to have known her personally. I remember when she spent a week in a lighthouse in our state, something I never realized was even possible. Hugs to you, Nancy; it's hard to lose a friend. What a great memory; I will be sure and hug friends and family today! Good reminder! So wonderful to have beautiful hand crafted memories of your friend. I'm travelling down the country to spend a few days with my old school friend over Christmas - so that will be very special for both of us.